First used in 2009 for the digital cryptocurrency Bitcoin, blockchain technology has moved far beyond its initial adoption in the financial services sector and is being applied across many industries, including manufacturing. By Ganesh Kalyanaraman, Global Delivery Head for Manufacturing, Logistics, Energy and Utilities, Cognizant. Blockchain technology is, in fact, poised to disrupt the manufacturing industry over the next few years with its potential to fundamentally redesign core manufacturing and supply chain processes. Major manufacturers incur enormous time and expense in managing their complex global supply chains — identifying and selecting trusted suppliers, negotiating and enforcing agreements, tracking products during production and delivery, and ensuring timely payment. These cumbersome processes are largely manual, still requiring e-mails, phone calls and meetings for closure. By automating manual processes, a blockchain network could ensure product quality and authenticity, accelerate transactions and reduce processing fees. While manufacturers recognise that blockchain promises to dramatically streamline these and other operational areas, many are holding back due to the lack of established adoption paradigms. However, manufacturers that adopt a wait-and-watch approach may find it difficult to catch up with more enterprising competitors. In order to reap the benefits of innovative technology, manufacturers should move quickly to gain experience with these and many other potential applications of the blockchain. But where should they begin their journey? While there is no single playbook for successful blockchain adoption yet, there are best practices that organisations can learn from, to navigate the shift. Many manufacturers find it difficult to understand how blockchain technology can be leveraged to address business issues and how much time will be needed to reap the benefits of its implementation. What’s crucial is the involvement of stakeholders from different business units such as procurement, design, manufacturing, sales and marketing in identifying how blockchain solutions can generate business value. Companies can benefit by creating a dedicated blockchain team with stakeholders assigned to spur innovation and adoption. A dedicated team can help drive the development of strategy by identifying and developing use cases, exploring the potential of working with business partners and researching partnerships with vendors. Manufacturers must remember that blockchain will not only increase operational efficiency, but also help create entirely new business models. For example, projects that marry blockchain’s shared infrastructure with 3-D printing illustrate how this emerging technology can elevate trust and open new market opportunities. 3-D printing allows designers and inventors to create new products anywhere and then produce them by sending the design files to a remote printing facility, effectively “borrowing” part of the factory on-demand when they need it. Major manufacturers can use 3-D printing to flexibly execute small runs of products that meet the needs of individual customers, while micro-factories and designers will gain the ability to produce innovative products targeted toward niche markets. Manufacturers should recognise that they may not be able to precisely determine the expected cost-benefits of a blockchain project at this point given its nascence. The cost-benefits of a project are typically long-term in nature and will become more apparent over time. Yet, organisations should be able to specify the objectives that each project is designed to achieve to create a yardstick by which to judge success. While business considerations should drive blockchain strategy, manufacturers will also need to attract or develop the expertise in how the technology can be applied. Manufacturers should use a mix of internal and external strategies to close the talent gap. The talent strategy should encompass internal blockchain skills enhancement in a variety of areas, including cybersecurity, risk management, compliance and legal. However, most manufacturers will, over time, find that additional skills are needed to apply blockchain thinking and technology, and they should look into hiring experts in blockchain-specific technical areas such as cryptography, PKI, information architecture, software engineering, network infrastructure and integration, and user interface/user experience, among others. In addition to upskilling current employees and hiring talent, manufacturers could also consider other external strategies to acquire additional expertise, including partnerships with blockchain technology companies and start-ups. Although blockchain holds the promise to be the next disruptive technology, its adoption is still in its early stages. Manufacturers need to put blockchain into practice, identifying concrete business problems and opportunities that the technology can help address. For each use case, a manufacturer should specify the actions needed for implementation, assess the resources required, create a process map, develop an implementation guide, and determine key performance indicators (KPIs) that can be used to evaluate success. The KPIs will allow the organisation to not only assess performance, but also communicate value to senior management. Developing a blockchain strategy should not be seen narrowly as a technology issue. A blockchain pilot project may demonstrate how the technology works, but it is even more important to learn whether the project is an optimal solution for the business problem being addressed and how a full-scale implementation would impact the organisation’s business. Blockchain’s distributed ledger technology could offer manufacturers the ability to streamline time-consuming and expensive processes involved in selecting, vetting and managing relationships with numerous partners in their complex global supply chains. 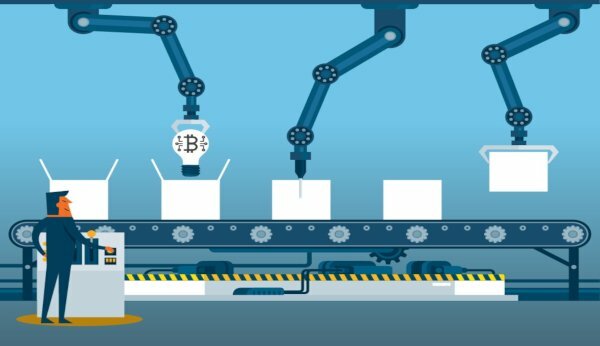 Yet, despite blockchain’s potential benefits, many manufacturers are moving cautiously, seemingly reluctant to commit to a new technology that is developing rapidly and that will require them to rethink their current ways of doing business and collaborate more closely with their supply chain partners. It is important for manufacturers to avoid the pattern of many IT projects that are massive in scale, time-consuming to implement, and slow to meet expectations. Instead, a nimbler, entrepreneurial approach is required to keep pace with fast-changing blockchain technology: start small, fail fast, identify what works, and scale quickly.